Creative Carbon Scotland co-hosted a sharing event on Tuesday 6 March with North Edinburgh Arts and Chris Fremantle. This Green Tease explored Embedded Artists Projects and discussed work placements undertaken by Edinburgh University Students at Creative Carbon Scotland and North Edinburgh Arts. Our work placement, Elly White, now shares some final reflections at the end of her time with Creative Carbon Scotland. From January – March 2018 Elly White, Abbie McGunnigle and Gabi Gillott, students from the Edinburgh College of Art, explored different approaches to socially engaged arts practices and embedded artist models, where artists are engaged for extended periods in community or organisational settings to contribute to wider environmental and social aims. My work placement has been at Creative Carbon Scotland (CCS) where I have been researching for the culture/SHIFT project, which explores how cultural and creative perspectives can contribute towards greater environmental sustainability. I have investigated local and international embedded artist projects including historical and current examples. This research will contribute to the longer-term development of an online Library of Practice for building and sharing knowledge. Keep an eye on the CCS website for more info soon! David Harding employed by the Glenrothes Development Corporation and appointed Glenrothes Town Artist from 1968 to 1978. Artist Placement Group which emerged in the 1960’s with the concept of placing artists in non-arts live contexts within organisations and industries. Mierle Laderman Ukeles who since 1977 has worked within the New York Department of Sanitation as a non-salaried member. 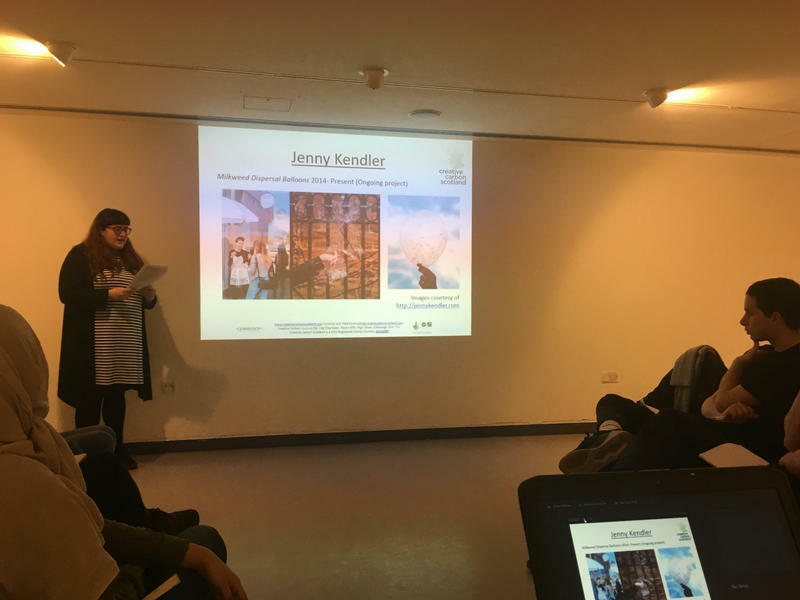 Jenny Kendler became the first artist-in-residence at the National Resources Defence Council (USA) in 2014 which allowed her the opportunity to collaborate with staff and have access to resources usually unavailable. A short discussion took place after my presentation with questions around the feasibility aspects of embedded artists projects such as the eighteen months seen with Artist Placement Groups placement of Roger Coward within the Department of Environment. Whether this was too long or it is an integral aspect for a success project. Another contributor mentioned how it was interesting to see examples of art engaging people who may not normally be interested, such as Jenny Kendler’s work involving the local community in the dispersal of Milkweed seeds. After this short discussion, it was now time to hear from the placement students at North Edinburgh Arts, a member of the Green Arts Initiative. Abbie McGunnigle and Gabi Gillott began sharing how they had mainly been participating in workshops and engaging socially with local communities. 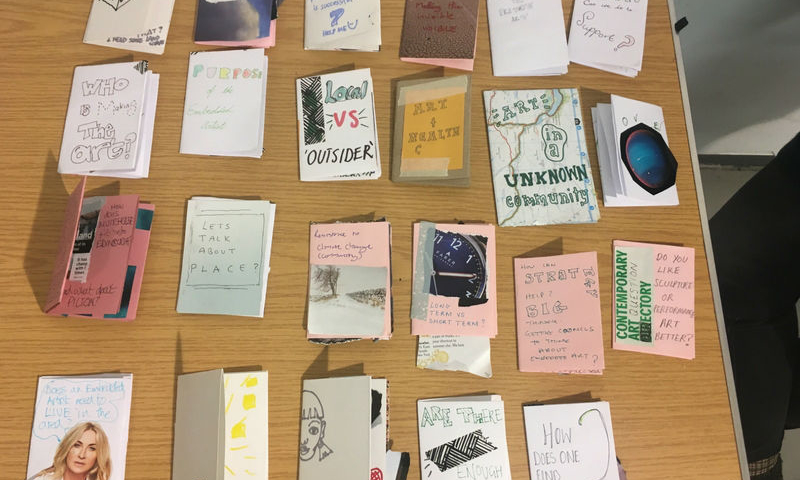 Zines became their chosen output for the placement, after Edinburgh College students Epoch 8. held a zine-making workshop. Abbie and Gabi felt that the making and reading of zines was a less invasive way of inviting people into a conversation, only requiring low cost, recycled materials and a starting idea to get going Their placement resulted in the proposition for a Zine library shelf in the café at North Edinburgh Arts, for everyone for access and contribute towards. We broke into small groups for the workshop where we were given instructions how to create a six page zine from one piece of A4 paper. We then worked in groups to create ‘exquisite corpse’ style zines where we each posed a question on the front cover of our zines, then passed it onto the person next to us to respond. These were passed around until the zine was finished. We had two minutes to fill in a page so this was a great opportunity for the Green Tease participants to reflect and respond in a quick manner to the information that had been discussed so far. Following the presentation and workshop we got back together as a group. Chris Fremantle encouraged us to get into pairs to contemplate and generate questions as we reflected upon the information shared during the Green Tease. How do we move beyond artists as engagement tools for councils and other contexts, rather than having an artist fix engagement problem, how do we embed creative approaches within wider strategy? Does this mean outcomes are already set within an organisation? Does it become social work or remain within artistic terms? Is the line between social work and art practice dependant on who funds and generates embedded artists projects such as charities or non-government organisations? Building legitimacy, does there need to be a gatekeeper within the organisation to stand up for the embedded artist? What do artists do differently compared to other sectors and disciplines such as community developers or architects, is it because of the aesthetic process and result art brings and would this change the outcome if it was not a visual artist embedded? The sharing event was incredibly useful for future considerations into the Library of Practice. Future case study research should cover more art practice types rather than just those with visual outcomes. The length of embedded artist projects was another aspect discussed throughout the Green Tease. As the library is being developed it would be interesting to follow the progress of current placement case studies. Thanks to all who participated and contributed to the event, especially to North Edinburgh Arts for hosting this Green Tease.